For those of us who prefer brick and mortar shopping, our smartphones have revolutionized the experience. Mobile devices can bring all sorts of good tidings: recommendations, discounts, and new abilities to find precisely the item we’re looking for, even down to the aisle. 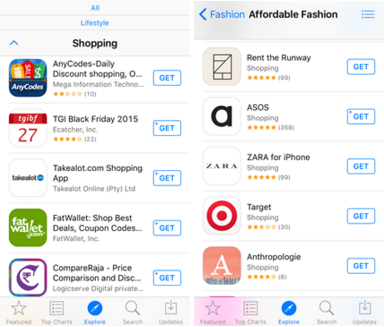 It’s safe to say that most major retailers have a mobile strategy these days—not to mention the proliferation of general retail shopping apps that offer discounts and deals at a range of partnered stores. But hark! As you shop, you should understand that many of these services, in order to deliver on their promises, rely on location technology. Location tracking allows apps to provide helpful services (like finding an item in a store), and is also used for secondary purposes, such as marketing, advertising, and business analytics. This Holiday Guide explores how these location tracking technologies work, and how consumers who wish to do so can opt out. There are many ways that your location can be assessed using the sensors on your phone. A few are precise enough to detect your movements inside a single store or a particular aisle, while others are more general or rely on aggregated data. Location data can be collected via cell towers, mobile Location Services, mobile location analytics, in-store Wi-Fi networks, beacon technologies, and emerging sensor technologies (lights and audio). Each method evokes different privacy issues and permits different consumer choices. Mobile operating systems use a variety of positioning systems within your phone—including the GPS, cellular triangulation, Wi-Fi, and Bluetooth—and combine it together under an umbrella called Location Services. This service, which is controlled by the operating system, provides a more accurate location than any individual system. Apps and websites must get your permission to access this source of data. Some of them need it to provide you with the service you want (think about car-sharing apps, or “find my phone” apps). Shopping apps might use it to help you locate a nearby store, or send you a location-based advertisement. But apps that have no location feature often ask you for your location anyway. Many of these apps, regardless of their purpose, may do this to create a behavioral profile of you as a shopper, and share this info with third party advertisers and online data companies. When your phone is on, in order for it to receive (and make) phone calls, it must be identified by the nearest cell tower with reasonable accuracy. Cell towers collect the device’s Cell ID, location relative to the tower, and signal strength. The accuracy can be relatively low in rural areas with fewer cell towers (to within several miles) and is more accurate in cities. Cell phone carriers offer location-based services on an individualized basis, to enable functions like tracking of minor children, locating a lost cell phone, or for apps that offer location-based marketing to users. These services are based on an “opt in” process by which the owner must provide clear consent. Many retailers (and other facilities, like airports and hotels) use Mobile Location Analytics (MLA) technology to understand the traffic patterns of people in their stores. Most MLA technologies operate by detecting your phone’s Bluetooth signal, as well as the Wi-Fi MAC address, a 12-digit string of letters and numbers assigned to your device by the manufacturer. This information can provide useful insights, such as how long customers stand in line, and how they generally move around within an area. Smartphones typically broadcast their MAC address whenever they are passively scanning for Wi-Fi—that is, whenever you have Wi-Fi turned on in Settings. This is how your phone automatically recognizes your home or work network when you arrive in those locations. Since most people carry their phones all the time and generally leave Wi-Fi turned on, a store can scan for MAC addresses and get a pretty accurate idea of how many people are in the store. For iPhone users running iOS 8 or later (i.e., most of the newer phones, including the 4S and later models), the iPhone randomizes the MAC address being emitted every time the phone searches for a Wi-Fi network. This limits venues from tracking unique devices over time. Nonetheless, if you’re running an older version of the iOS or simply uncomfortable with the practice, there are ways to opt out: users can enter their Wi-Fi and MAC addresses at smart-places.org to alert participating companies that they do not wish to be tracked. Alternatively, shoppers can turn off the Wi-Fi and Bluetooth on their devices when they’re out of the house or away from a trusted network. Many retail stores are now offering free Wi-Fi to their customers as an added benefit to the shopping experience. This can certainly be convenient, especially for users with limited data plans, permitting easy access to the Internet while shopping. In addition to the information collected by mobile location analytics (MLA), described above, stores offering free Wi-Fi can generally collect more information, including any web browsing you do in the store. If you are required to provide an email address or name to log in to the service, the retailer may be able to associate your location with other individualized information (purchasing habits, or other online activities, such as social media behavior). 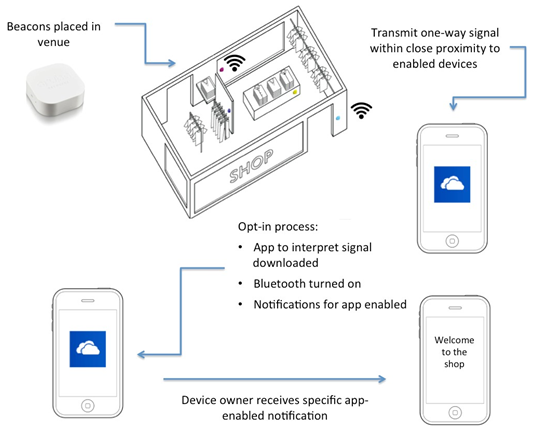 Increasingly, major retailers are installing beacons in their physical stores. Beacons are simple—essentially just small radio transmitters. They emit a low power, one-way Bluetooth signal that can be picked up by your mobile app or computer. Ranging in size from quarter-like to palm-sized, they all look a little different and are sometimes designed to blend into their environments. Beacons only send signals one-way, so they don’t actually collect any data. Rather, it is the app that collects data, by detecting when a beacon is nearby. Thus, if a brick and mortar store chooses to deck the halls with beacons, a shopping app can pick up their signal as you walk in the aisles or browse for items. 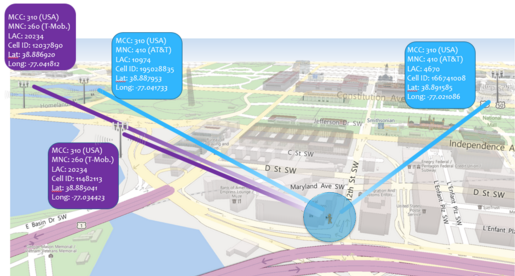 Beacon-detecting apps can use this information to send you location-specific notifications. For example, when you walk up to a display of holiday sweaters in your favorite store, the app could pop up with a discount for sweaters. Shopping apps can provide loyalty programs that give points for walking into stores, often allowing linkage between location data and other consumer behavior information (such as social media activity) that can be collected and shared across ad networks and other third parties. Generally, apps should provide notice to users when Bluetooth is being used to track location by detecting beacons. Although Bluetooth is frequently being used in conjunction with Location Services (which requires permission), some apps that use beacons may continue to collect data when Location Services is turned off. Thus, users should be aware of how beacons work, so that they may choose to limit this collection by turning off Bluetooth on their phone when it is not in use. Another option is to keep the app but turn off its ability to trigger notifications. Holiday shoppers should also be aware of emerging methods of location tracking that make use of the phone’s array of other sensors to detect signals emitted from devices placed within physical stores. For example, “audio beacons” may be used within a retail store to emit ultrasonic audio signals. In much the same way as Bluetooth beacons, described above, the devices emit audio signals outside the range of human hearing, and a mobile app can detect those signals using the device’s microphone. Similarly, LED signals can be emitted via lights installed in a store, and detected by an app that has received permission to access the phone’s camera. Because of the requirements of mobile operating systems, users can control which apps are given permission to access the device’s microphone and camera. Nonetheless, apps requesting permission to access these sensors may not always be clear about why they are asking, or for what (sometimes unexpected) secondary purposes the data may be used. As a result, users should read carefully and be informed about why shopping apps request these permissions. It’s clear that there are a range of benefits to location-based services. The blessings of saving time, price discounts, and overall convenience give the often weary world of last-minute holiday shoppers a reason to rejoice. However, as we increasingly turn to our smartphones to shop online or make our decisions in the physical world, it’s important for us to understand the scope of location data being collected about us, and the reasons for which that data is being collected, so that we can make informed choices.